Potato plants are relatively easy to grow and require little maintenance during the growing season. After harvesting, plant potato peelings to produce the next potato crop. Keeping the potato plants covered and sufficiently watered are the two primary keys to successful cultivation, as the potato does not require specific soil conditions or nutrients. Purchase the type of potatoes you want to grow. 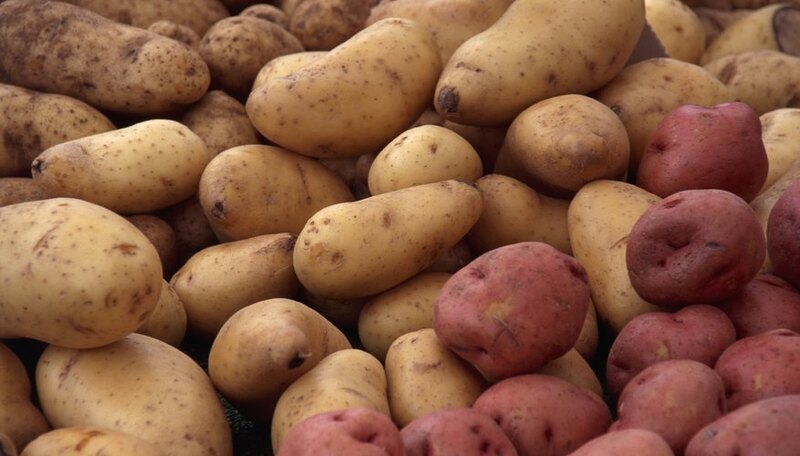 With more than 1,000 potato types to choose from, you should be able to find a variety to suit your taste. Inspect the potatoes closely and make sure no disease is visible, to ensure the healthiest potato crop possible. Peel the potatoes with a sharp knife, taking care not to make the peels too thin and not to damage the potato eyes, which are the places from which the new potato plants will grow. Leave the potato peels out in the open air for a full 24 hours to "cure" the potato cuts and minimize the potential for disease or rot setting in at the site of the cuts. Turn over the soil in the planting area with a shovel and place the potato peels in the soil, approximately 18 inches apart, with the potato eyes facing up. Cover the peels with two to three inches of soil. Water the newly planted potatoes, and provide one inch of water per week thereafter. Cover the new potato plant growth as it appears by mounding straw, hay or peat moss over the plant, which allows the potato tubers to continue to develop below ground and protects them from the drying effects of the sun. Potato greens are toxic, as are green potatoes. Do not eat the greens, and either peel potatoes before eating or wait until they are fully ripe and all the green is gone from the peel.